Vancouver, BC – The Institute of Professional Bookkeepers of Canada (IPBC) announces the certification of Laura Kenway, of Cluculz Lake, British Columbia, as a Certified Professional Bookkeeper (CPB). Ms. Kenway is self-employed and operates Lakeshore Bookkeeping Services, serving the Highway 16 corridor between Prince George and Vanderhoof. She runs a small, personalized practice that specializes in home based businesses. She also provides free of charge at Bookkeeping-Essentials.com, an online Small Business Accounting Guide dedicated to supporting work from home business owners who do their own books. Ms. Kenway received the CPB designation after passing an invigilated national exam. Applicants must achieve at least 75 per cent in order to pass. The exam is based on Generally Accepted Accounting Principles (GAAP) accepted worldwide. 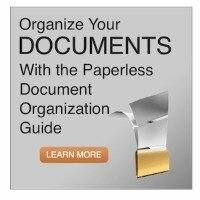 for easy to understand tips and strategies on how to go paperless. I Love, love, LOVE this site! Did I mention I love it?! I do my own bookkeeping with QuickBooks and whenever I am stuck on something, I refer to your website and find exactly what I'm looking for to help. Everything is explained so well, in plain English and easy to follow. This site has been helpful many times, but most recently, with GST filing. I filed for the first time this year and when I went to file the next quarter, the numbers hadn't cleared from the previous quarter and everything seemed to be a mess. I found out on your website that I had filed with the CRA but did not complete it in QuickBooks. By following your steps, I sorted it out and it was a very easy fix. Phew! Thanks! Thanks for the information. It is nice to see there is an online site where I can go get answers to my bookkeeping questions. It was really a stroke of luck I came across this site. I googled my bookkeeping question to see if I could get an answer, a shot in the dark, and bookkeeping-essentials was one of the results listed. I looked over some other sites but none were as flexible as this site. I got a quick response and I will be using this site in the future. Thanks again. I love your site...its very homey!!! It's like reading/talking to a friend!! Thanks!! Your website is positively BRILLIANT! I don't care at all for the numbers side of my business, but you've made it interesting, fun, comfortable--downright enjoyable! Bite-sized WELL WRITTEN bits walking me through fundamentals, encouraging me, explaining. (Note: "well written" covers everything from "interesting" to "intelligent." The reader doesn't stumble over elementary grammar errors, lots of typos, etc.) I've only just discovered this lovely gold mine! I have just come across your site and it's great...thank you so much for the time it must take you to compile the data and information. I have no accountancy or book keeping knowledge and am currently trying to learn QuickBooks via YouTube. (lol) There must be an easier way as I don't have the time or finances, what with starting a new business, to attend a course at college or similar. As a novice at the bookkeeping game, this site has become my go to site for research. Thank you for the great resource. I do my data entry one or twice a year (very low volume) and I find I need retraining on Quickbooks for things like depreciation/CCA. Thank you for your comprehensive reply to my question. I really appreciate the time you took to explain it to me. This is an absolutely awesome site! I am not lying. I went to Chapters to try to find something just like this and they did not have what I was looking for - which your site does ... which is good definitions and explanations. I am going to book mark this page if that's okay. ... Great job and thank you. I will definitely use this resource. Lake you're awesome in every way. I have had some insight about how to properly classify some accounts. Thank you so much for this website. I am interviewing for my first bookkeeping position in over 10 years--and my first in Canada. I have AAS degrees in Accounting and Business Admin from the US but have never worked in "my field" since immigrating in 2000. Your website makes me feel more confident I can actually do the job I am interviewing for. So far, I have been refreshing my knowledge and preparing for a job interview. I've bookmarked the site for WHEN I get the job! I love your website. Just love it. I posted a question on Accumulated Surplus and you asked me to comment on your comments. I really appreciated reading what you posted and it did help. Especially the part of talking to the accountant. That really makes sense. I find more and more that I interact with the accountants to keep on learning. Love Love Love your website. Just discovered it about 3 weeks ago and have been on it lots since then. Wow. I'm so thankful to have stumbled across your site, with the assistance of Google. :) I love your style of writing, your approach, and your message. Thank you for your time and efforts. In a nutshell, your light humor and simple approach is refreshing and uplifting. Your site is great by the way. I just came across it. Thanks for responding so quickly ... I really appreciate all the forum help ... I do Love the forum and have looked through other questions on it and feel it will greatly help in the future. Your site is fantastic and I will recommend it to anyone asking about bookkeeping help. It (your site) is very helpful and thank you for your tips and advice. I am so glad I found your site. Thank you so much for your hard work on your site ... I find I learn quicker and easier with you than I did with courses. Your site has helped my knowledge, learning new things and with the explanation of terms/items. Keep up the good "BookWORK"! Naomi, Balance Your Books, Squamish, B.C. This website has been very helpful. It's been too many years since school and I'm a bit rusty. I just found this site tonight. It's going to help me a lot as I learn how to use my Quickbooks more fully (I've only used it for payroll). Don't ask me how I've managed to keep the books this long -5 years- without knowing much more than how to balance a checkbook. I'm getting some help from a professional now, but your site will keep my pro costs down. Thank you. I will definitely donate once I begin to use it with my QuickBooks. It's [your site] easier to understand than Help in QuickBooks. QuickBooks assumes I know bookkeeping concepts. It [your site] appears to be very thorough, though I've only scratched the surface of what I can learn. I took an online bookkeeping class a couple of years ago, but this site has direct application to quickbooks and it's a searchable site! Thank you for providing valuable information regarding home business taxes on this website. BTW, did you say Bookkeeping? Cuz I fell asleep... just kidding! Absolutely a great site! I have often dreamed of having a similar site but figured I might have to wait until I retire to get the time. I have bookmarked this site and will return again. You have a wonderful website. Thank you so much for letting me know you have one now. [It] is really well done and very, very informative. Also really charming. I'm enjoying reading your blog! Thought I'd drop you a quick note of encouragement. This is a marvelous site and one that I would like to use as the basis for training bookkeepers. I am a CPA here in the states and am in the process of building a what will hopefully become a substantial bookkeeping business (not a dark wood & gold lettered CPA firm). I want to serve the small business owner with the day to day service they need. You have obviously put in an enormous amount of time and effort here (there is no doubt there) and provide a wealth of fantastic information. R. Keith Pierce, CPA, P.A.